The Backyard Missionary: Are You Freaking Out About Praying Out Loud? 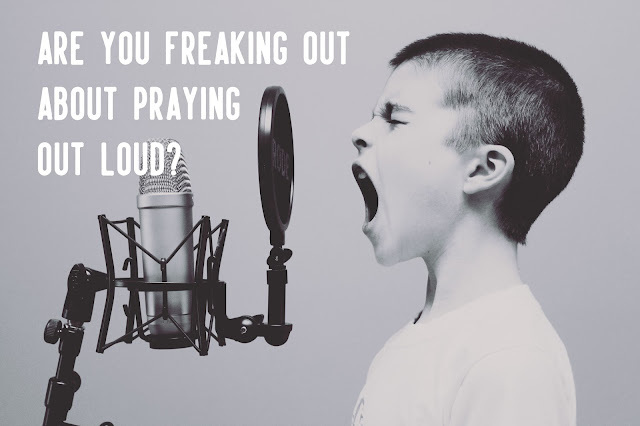 Are You Freaking Out About Praying Out Loud? It’s a phrase I have heard time and time again from countless women. It usually comes on the heels of the suggestion that we are to gather together and pray. I know this fear because I once felt this way too. The moment prayer would begin I would start to rehearse the prayer in my mind. I would think up words to say and arrange them to sound “godly” or “spiritual”. Then, in a moment of quiet, I would recite my words out loud and hope to hear a few resounding “amens” from others as reassurance that I had said something worthwhile. The whole event was rather stressful and left me with anything but peace and a longing for the quiet of my home and my private prayers. As I grew in faith I came to realize much of what I was fearful of was silly preconceived notions of what prayer ought to be. As I picked through them I gained confidence in public prayer. Here are a few of those notions to help you if you too are one of those people who dread public prayers. 1. Our prayers must sound eloquent and wise. False. There will be some who pray with words that would make any english university professor applaud. I’m guessing that those who pray like that also speak like that. You know how my prayers sound? In this phase of life they are about as grandiose as my three word sentences to my toddler. Simple, clear, concise, but not dragging and that’s ok. God doesn’t need eloquently worded prayers, he needs genuine hearts. We don’t pray to impress the others in the room, we pray to draw near to God. He knows who you are, and he wants YOUR prayers in the way YOU pray them, not in the way others pray them. Don’t try to sound lofty, just speak as you normally do. After all, prayer is just a fancy word for talking to and listening to God. It's still just a conversation. 2. We need to pray exactly what others are praying for. False. “We need to pray for our nation right now,” says the first person. It is a noble request worthy of prayer, so we begin to pray for our nation. But suddenly, God begins to stir your heart towards something else. Perhaps you really, REALLY feel like you need to pray for your pastor. Or perhaps you really, REALLY feel like you just want to bust out a worship song and praise God. Ok, maybe I’ve made you uncomfortable with that last one, but the point is this: God’s will is what we are seeking. As we seek him, he will naturally stir our hearts towards his desire. We cannot see the full picture, so while the focus may begin with a prompting to pray for our nation, maybe, just maaaaaybe God knows your pastor will need support to stand in the nation. Or maybe, just maaaaaybe God knows of a place that needs more prayer or praise, and the nation, in that moment, isn’t it. Don't worry about speaking from somewhere out of left field. If that's what God has placed in your hear speak it out! He know how it fits into the prayer even if you, or others can't make sense of it. 3. I don’t need prayers for myself. False. Sometimes when we gather, the request is to prayer for each other. You know what’s really scary? Admitting you need prayer from others. It means you have to admit that you are struggling somewhere. It’s easy when someone says, "can I pray for you?" I’ve yet to meet someone who will turn that down. It’s different to volunteer your request to be prayed for. I have felt that fear, and can I just say that the fear of speaking up is ALWAYS short lived. At the end of the day, most people who are committed to the Lord know that we cannot walk this crazy world on our own. We are here for each other, and sometimes that means we are here to hold each other in prayer and petition. When we stop buying into these false notions the fear of praying publicly will diminish. God will slowly give you more confidence as you go. If you’ve never prayed in public, try a sentence next time. Just one. That’s ok. Your obedient heart to serve God in prayer will not go unnoticed by Him. He will strengthen you as go bravely. Copywrite Sarah Slanzi 2017. Simple theme. Powered by Blogger.